If you enjoy gaming and are on a budget, a good solution is the $199 Xbox 360 Slim. However one thing that is lacking is hard drive space – only a 4 GB internal drive. Here we look at getting more space by adding a USB flash drive. Note: You can add an external drive to the Xbox 360 Slim 4 GB model, however, you can only use up to 16 GB of the space. So, if you were to add a 160 GB external drive for example, you’ll only be able to use 16 GB of it for Xbox storage. 1. For this example we’re going to hook up a 16 GB flash drive since that’s the limit. Insert the flash drive into an available USB port on the back of the Xbox Slim. 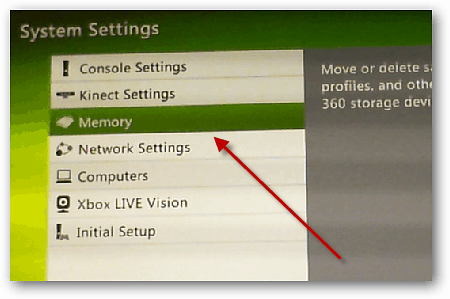 Turn on the Xbox and from the main menu, navigate to My Xbox >> System Settings. 2. Then in System Settings select Memory. 3. 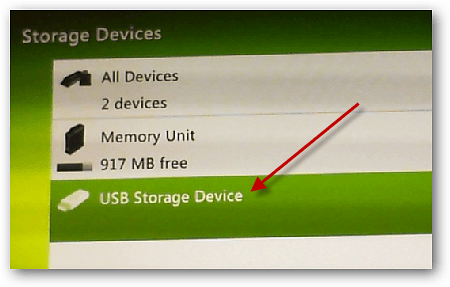 In Storage Devices select USB Storage Device. 4. Xbox will need to configure the USB flash drive so it’s compatible for data storage. Select Configure Now. 5. On the Configure Device screen select Yes when it asks if you want to remove all content and configure it for Xbox storage. 6. Then wait while your Xbox tests and configures the flash drive. In our tests it took under a minute. 7. After it’s done go back to your flash drive or Memory Unit as it’s called in the menu. 8. Now here you can see it’s ready to use to store data. 9. A quick test to make sure it works is to start up a game from your collection. For example here we started playing BioShock, and when the game started it asked where to store game progress, and were able to select the USB flash drive. 10. After playing it for a bit, we created a new save point, and when you go back in to look at your drive, you should see the that it was stored on the flash drive. Using a flash drive versus an external hard drive is a good idea to get extra storage space for the Xbox 360 Slim 4 GB model. This way you won’t need to mess with more wires and an extra piece of hardware cluttering up your gaming area. You can use an external hard drive as well, but just keep in mind that you’ll only be able to use 16 GB of space. Although I am sure there is a hack out there somewhere to get around that limitation. If you know of any, let us know in the comments! Is there a way to flash the xbox360 4gig using a usb/flash drive, please let me know. What kind of flash drive did you use. I’m currently looking for one and I don’t want to waste money on trying to format one that won’t work. I bought a 16 g sandisk thumb drive and it works great. Will it accept another drive at the same time? Inserted it in my xbox and bam, it configured to the xbox and then I moved my BOPS 2 Revolution to the flash drive with in 2 minutes, tried the Revolution map pack and it worked with out any errors. I also have noticed that some flash drives loose space, not this one, after configuring I lost 512k out of 8 gig, not bad at all. I don’t know why the 16 gig did not work, I know the flash drive cant be lower then 1 gig. But what I did was just buy two Dane elec 8 gigs. I only play a few games, my xbox is the 4gig model. so using my flash drive I freed up all my system storage.